Ahhh yes, I remember this historic event. Quite a party it was too. Festivities raged for 2 weeks across the worlds of Norrath and Sosaria. Day after day of events for members, prizes, drinking and lots of fun. Why all the big fuss? Well thats an easy one. 99.999% of all guilds will never achieve what The Syndicate has achieved. At a size of hundreds of members, having survived more than 4 years at this time, they had beaten the odds. The average lifespan of a guild is 3 months. The average size is less than 20 members. 99.999% if all guilds fail long before the reach either the size or the duration that The Syndicate has. None, to date, had achieved both. There are several quality long term groups out there in various game worlds that should be respected, but none have put together both the incredible size as well as the longevity together with untiy, teamwork and friendship despite the size. Truly something to celebrate. Also about this time some great articles came out about The Syndicate speaking very well of the guild. And celebrate they did. 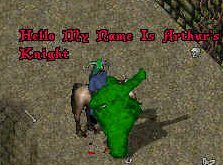 The festivities began over in the world of Norrath and ran for 8 straight days. They included contests like a pvp battle royale in the city of Paineel, a drunken race contest around the aviak cities ramps (many a wouldbe racer fell to their deaths that day) and a very fun event called "Build a Train". Using new, level 1 chars, in a newbie zone (so that the monsters wouldnt aggro and hurt any other players) members were sent out to see how large of a train they could build and return alive with. Points were awarded based on number of monsters and toughness. Kyser came in first place scoring 12 points. Tarzool came in second when he got 7 points (tied with 3rd and 4th place) and went into a runoff competition where he scored 9 points. Sheehand scored 5 addition points in the runoff competition coming in 3rd and Rendgar finished 4th. Fesitivities then shifted to the world of Sosaria where they raged for another 8 straight days. Events in this world included a spectacular Scavenger Hunt hosted by BHR squad, a Casual Fighters battle hosted by Fabren, a Ladies of The Syndicate auction raising 92,000 gold for the guild treasury, a costume/best dressed contest (won by Windy in 1st, Myrtev in 2nd and Jupiter in 3rd), and a very off the wall event called the "Screenshot Game". In this game contestants where given alist of screenshots they had to get. They got as many as they could and sent them in. The team with the most points before time was up, would win. 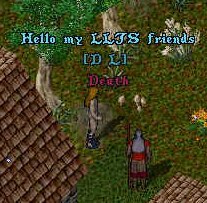 Shots included things like finding a red, pkiller (who normally dislike us since we are anti-pk) and getting him/her to say "Hi my LLTS Friends", or going up to a poison elemental and asking it to be your friend, or going up to a group hunting liches, while grey, and saying "Does anyone want to buy the katana of vanquishing I just found?". Lots of laughs were had by all. This was won by AK/Dak in 1st, Thor/Windy in 2nd and Lazarus in 3rd. 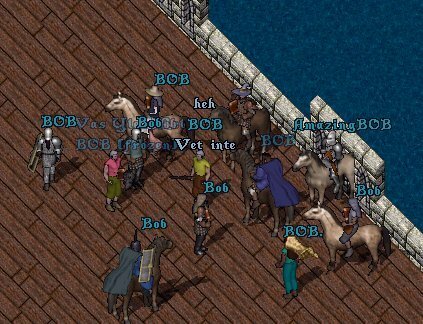 One of the other funny events that happened was an Attack Of The Bobs over on Test Center. Many made up chars called Bob and a large battle royale took place.